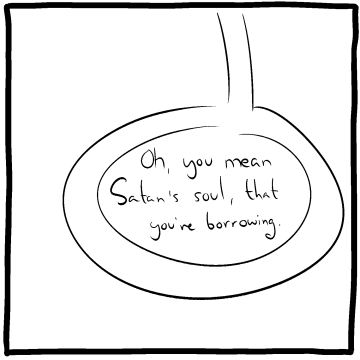 SMBC Comics Forum • View topic - [2018-Jan-20] Borrowing Satan's soul? I don't understand this reference. Re: [2018-Jan-20] Borrowing Satan's soul? It's saying that his soul is borrowed from the devil and not god as many religions imply. I interpreted it as, his soul unknowingly already belongs to satan, and he's just borrowing a "satan's soul", so he's already pretty much screwed no matter what he does.